You can’t make a reservation, and you can’t pay. 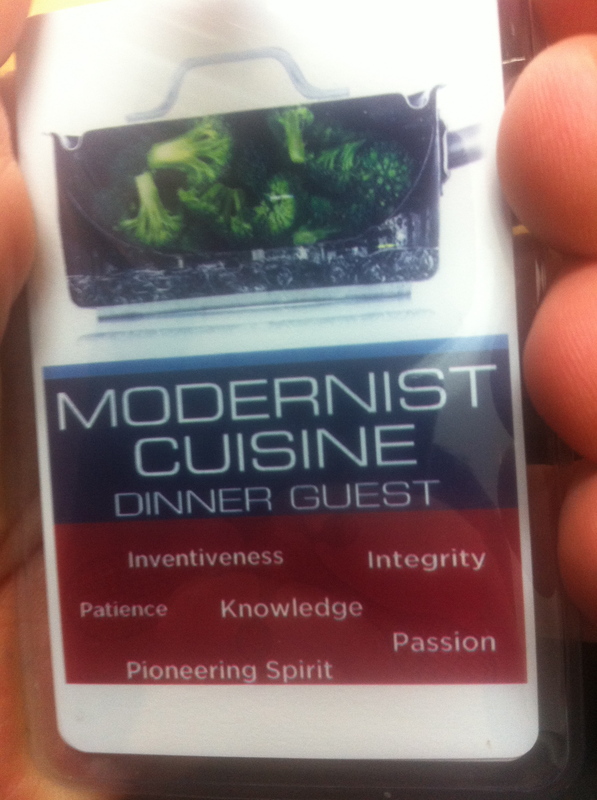 Last night I had the rare privilege of attending one of the dinners at the Modernist Cuisine Cooking Lab. The phrase ‘rare privilege’ can be overused, but in this case, it is completely warranted. The purity and concentration of their flavors is off the charts. Twenty-nine courses of it. Needless to say, but it needs to be said: it was amazing. A little over a year ago I did a post on knives after Bob Tate came to my culinary school to do a talk (here is the original post…click). My friend, Jethro (click), knows Bob Tate and offered to get our little group of gastronauts together to go see the art of knife sharpening up close and personal. I still use Bob’s tips to this day and it was really amazing to be invited into his home where he does the knife sharpening and has honed his own skills. He trained under Bob Kramer who has his own signature series for Shun so it was honor just to be around Mr. Tate to at least get a glimpse into the mastery that is knife sharpening. We each brought a knife for Bob to sharpen for us…… Seriously Jethro…..a pink knife?!?!?! Uh….. Anyway, Scott brought his shiny Shun knife (middle) and I brought my money maker Mercer knife (right) for a little honing and sharpening action. Bob showed us a few new projects he was up to and how he can create serrated knives and even sharpen them. It was amazing to watch him take a $2 knife and turn it into something usable and extremely sharp…..Eric “likes” the degree of sharpness. I have a really weird attachment to my knife. It’s not expensive or special but it’s been along for the ride while I’ve moved through and cut thousands of things with it. When I first started using it I had no idea what I was doing…..it was too big……it was heavy…..it wasn’t my 7 inch santoku that I was used to using. I stuck with it and now I treat it like a really great friend of mine. I sharpen it myself because I don’t trust anyone else to even touch it but when I was in the home of Bob Tate I let him have it……I guess it’s kind of like dropping your kid off at a baby sitter…..weird stuff. Bob sharpened up the pink knife and while I saw him doing it I noticed how he moved the knife over the belt gently. He asked me not to film his finishing process and not really talk about it since it was something he had learned from Bob Kramer and it really is the difference from him doing something amazing or just entrusting your knife to that random clerk at that one store with the French name downtown. He finishes and tests every knife by doing the newspaper test. Look at that shiny new edge. No matter where I go, where I cook, or what knife I buy, Bob Tate is my knife sharpening guy.